elastic, slightly sharp, porous, lightweight fabric, produced from fine, sharp-twisted singed yarns; in close-sett linen weave, which makes it transparent. Is typically one-colour or printed. Used for ladies' dresses and blouses, and as a decorative fabric. 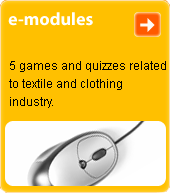 V. may be processed as a cotton, silk or woollen fabric. The name is given by the French ("voile" = veil; i.e. a lightweight, transparent fabric).